Budweiser is losing its market share among 21-27-year-old Millennials and its place on bar-tap line up to craft brews in many markets. According to a recent Wall Street Journal article, some 44% of these coveted drinkers have never tried Budweiser. Bud Light took the top tap in Anheuser-Busch InBev NV’s product line-up in 2001, and Coors Light bumped regular Bud to #3 in 2011. In an attempt to win back favor, it’s going so far as to do away with the universally beloved Clydesdale commercials this holiday season and focus entirely on this young demo with the ubiquitous social “friends and sharing” approach. Holiday spots will feature 20-somethings looking into the camera and answering the question, “If you could grab a Bud with any of your friends these holidays, who would it be?” This move also includes a reduced presence in Major League Baseball and NASCAR sponsorships in favor of food festivals, the impetus coming from internal research that indicates half of 21-27-year-olds claim to be “foodies.” Also on the events docket are an expanding sponsorship of college town parties around the Made in America Festival it started in 2012 with Jay Z, and raves with the electronic-dance music DJ group Cash Cash. In addition to the outcry about the future care and feeding of the Clydesdale team (never fear, they will be included in other marketing efforts) and the impact of the termination of the emotionally charged commercials on the tissue industry, A-B realizes it also may alienate its core drinker audience (ages 28-34) with this move. Nevertheless, they claim even their core-drinker consumption is expected to decline as they settle into the economically delayed responsibilities of adulthood. A-B claims it is taking the long view: according to the National Beer Wholesalers Association, those turning 21 peaked in 2013 and represent the largest number of new drinkers since the Baby Boom generation started filling bar seats. Its research indicates that craft brews currently make up 15% of 20-somethings out-of-home purchases, compared to 10% for more mature drinkers. (You will see in the table below those statistics are amplified in Seattle.) In addition to craft beers, other beverages such as hard cider, flavored malt beverages and read-to-drink cocktails are chipping away at Budweiser’s market share. That drastic of a target-audience switch may not play well in all markets. Among beer drinkers in the Seattle market, domestic beer still reigns king (60%), followed by imported beers (48%), microbrews/craft beers (38%), light beer (37%) and hard cider (17%). 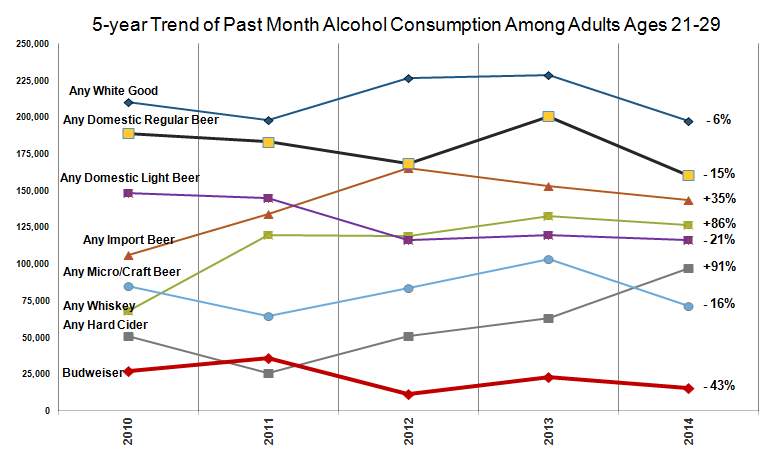 Domestic regular beer ranks even higher with those ages 21-29 at 67%, followed by import beers. 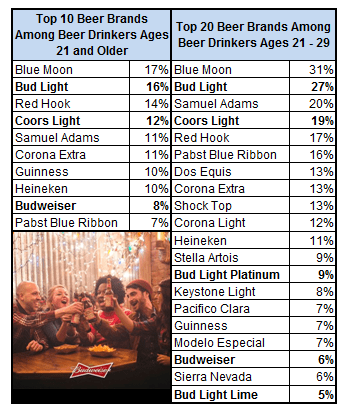 Blue Moon shines brightest among favored brands (17%); Budweiser ranks 9th with 8% market share among beer drinkers and trails other A-B brands Bud Light (16%) and Coors Light (12%). Only 23% of all beer drinkers consume their favorite beverage in a bar or nightclub where the Bud taps are disappearing. For those ages 21-29, nearly half consume their beer in bars and nightclubs. Budweiser drops to 18th in this demographic, and it has lost more than 40% of its drinkers in this age group over the past five years, so A-B’s concern is legitimate. Still, stabling the Clydesdale team?! Maybe the better strategy would be to get more (Budweiser) beer drinkers of all ages out to bars and nightclubs before they focus on their beverage of choice! 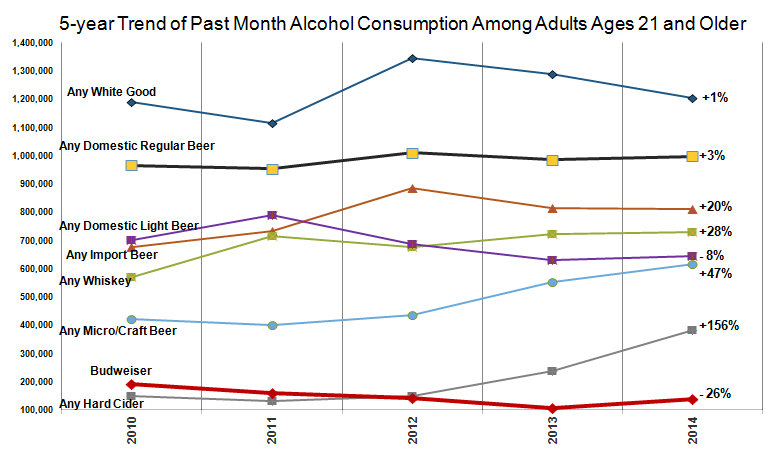 More than losing market share to light or craft beers, or even the nascent hard cider movement, is the growing consumption of hard liquor among beer drinkers of all ages. In the past 30 days, half of all Seattle beer drinkers have consumed white goods (gin, vodka, rum, tequila, etc.) and one-third have consumed whiskey. Of those in A-B’s target demo (ages 21-29), 65% have consumed white goods and 45% have consumed whiskey. Whiskey and hard cider share of market has nearly doubled with this group over the past five years. Malt beverages and pre-mixed cocktails are barely on their radar. Surely hard-liquor and cider drinkers still appreciate a Clydesdale moment! Will the walking dead bring life to the Budweiser brand? In the WSJ article, a former A-B senior marketing executive expresses concern about the marketing about-face. He thinks the new approach will alienate core drinkers to the point that they will say, “That’s not my Budweiser anymore.” And I tend to agree. In maker-movement centric Seattle, from brews to distilleries, nearly eight in 10 Seattle Bud drinkers are male. Four in 10 are ages 50-69, but the next highest consumer-age segment is ages 18-34 (at 29%, with 16% ages 21-29), so the current messaging isn’t totally lost on the younger demos. Eight in 10 haven’t graduated from college and fewer than one in 10 currently is a student. Slightly more than half are unemployed (including retirees). Does that sound like a complementary Foodie profile to you? And by going in this direction, isn’t Bud taking on yet another competitor in wine? Budweiser’s website claims the Clydesdales, which have been a hallmark of the brand since 1933, “are the living embodiment of America’s great industrial spirit.” That spirit has been missing from most Millennials’ life experience, so maybe it is time to move on to zombie realities. Yet, I can’t help but feel this marketing move is changing horses midstream, and we all know how that turns out.